Easy Mulligatawny Soup is a savory Indian curry soup made with apples, carrots, rice, and chicken in a seasoned creamy broth, ready in under 60 minutes! 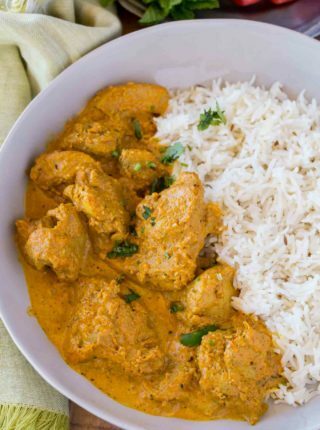 Indian dishes are some of my most popular recipes here, and right now our favorites are Easy Tandoori Chicken, Slow Cooker Butter Chicken, Chicken Korma, and my favorite Chicken Biryani! Easy Mulligatawny Soup is one of my absolute favorite Indian recipes of all time, because it’s creamy, savory, and packed with flavor. I like to make this with chicken breast, carrots, apples, and rice. 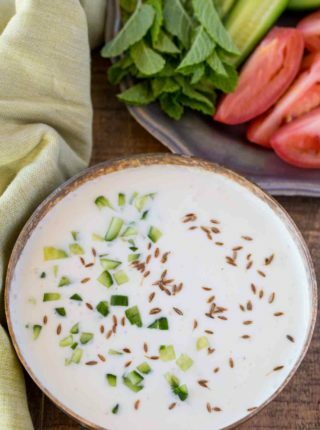 You can add other vegetables if you want to, like sweet potato or green beans, and make sure to serve this soup with fresh naan, chopped cilantro, and plain yogurt. WHY IS IT CALLED MULLIGATAWNY SOUP? Mulligatawny is actually an English soup from the 16th century, but made with a South Indian influence. The name roughly translates to “pepper water”. 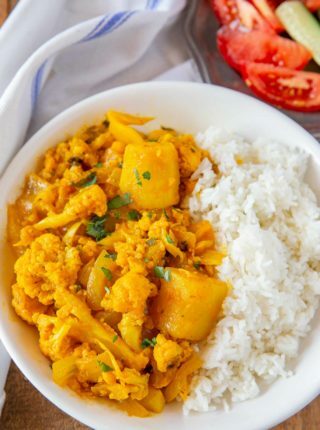 You can find a few different versions of this soup, but most include curry spices, cream, and vegetables, while some variations use cloves, lentils, or different types of curry powder. Turn on the sauté feature and melt butter. Brown the chicken on both sides, then remove from pot and set aside. Add the onions, celery, carrots, seasoning, and butter. Sauté for 1-2 minutes, then add flour and stir for another 1-2 minutes. Add all other ingredients and chicken to the pot, except cream. Close and lock the lid and seal the pressure valve. Cook on high for 8 minutes, then let it naturally release. Stir in cream before serving. Add chicken and vegetables to slow cooker. In a separate bowl, whisk together flour, spices, and broth. Pour over chicken. Cook on low of 6-7 hours, or on high for 3-4 hours. When there is 2 hours left of cooking time, add the rice. With 20 minutes left in cooking time, slowly stir in cream. HOW LONG DOES MULLIGATAWNY SOUP LAST? Mulligatawny will last tightly sealed in the refrigerator for 2-3 days. Reheat in a saucepan over medium-high heat, until warmed through. CAN YOU FREEZE MULLIGATAWNY SOUP? You can freeze mulligatawny, but they dairy might not freeze well. I would make the soup up until you’re supposed to add the heavy cream, then instead of adding the cream, let the soup fully cool. Then store in an airtight container in the freezer. When you’re ready, defrost in the refrigerator and add to a saucepan. Bring to a simmer, then stir in the heavy cream before serving. Mulligatawny will last frozen for 2-3 months. Add the heavy cream as you are continuously stirring, and make sure the soup is only simmering and not boiling to prevent the cream from curdling. You can substitute the cream with canned coconut milk. Make sure you use the type in the can, because it is different from the coconut milk you’d find in a carton next to the regular milk. I also wouldn’t use the low fat canned coconut milk, because you need the fat in this recipe for the creamy texture of the broth. Substitute the rice with lentils for another variation on this Indian soup. Some recipes call for green or red lentils. I use chicken breast here but you can use boneless skinless chicken thighs without issue. You can leave out the chicken and use vegetable broth to serve this as a vegetarian soup, if you do to add more heartiness I would add in sweet potatoes, the flavors would work great especially if topped with cilantro. You can top this with fresh chopped cilantro, or plain yogurt before serving. 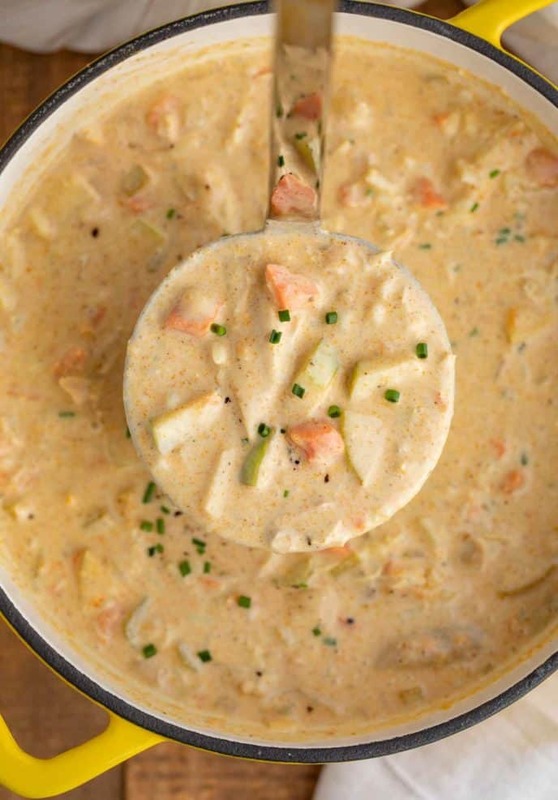 Easy Mulligatawny Soup is a savory Indian curry soup made with apples, carrots, rice, and chicken in a seasoned creamy broth, ready in 60 minutes! 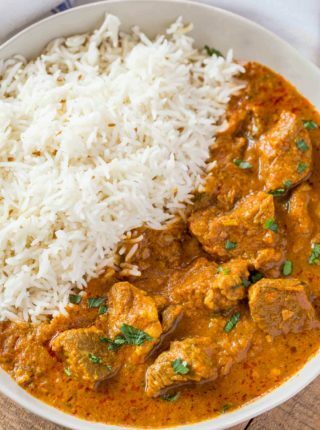 Add the butter to a large dutch oven on medium heat then add the onions, celery and carrots and cook for five minutes before whisking in the flour, curry powder, salt, pepper and cayenne until fully mixed in. Slowly whisk in the first box of chicken broth until smooth then you can add in the second carton faster, bring to a boil then reduce to a simmer and cook for 30 minutes. 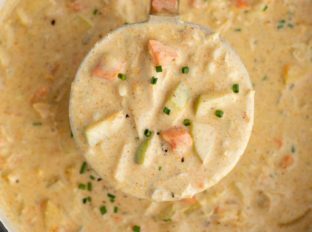 Add in the apples, chicken and rice and simmer for an additional 18-20 minutes until the rice is finished cooking and finish with the heavy cream letting it come to temperature and rise back up to a simmer before serving. Made this today on a cold and very unusual snowy day in Vancouver, Canada, had my son, his wife and our grandson for dinner, this was well received, I had doubled the recipe. I also used vegetable broth instead of the chicken as my daughter in law is vegetarian, I made it up to the sage of adding the rice and chicken I separated her portion plus extra for her to take for lunch tomorrow, I then added tofu to hers, it was very good, the balance I did with the chicken, everyone enjoyed this filling meal, I was told this is a keeper recipe. I’m so glad you all enjoyed it, Janet! Thank you so much for the 5 stars. 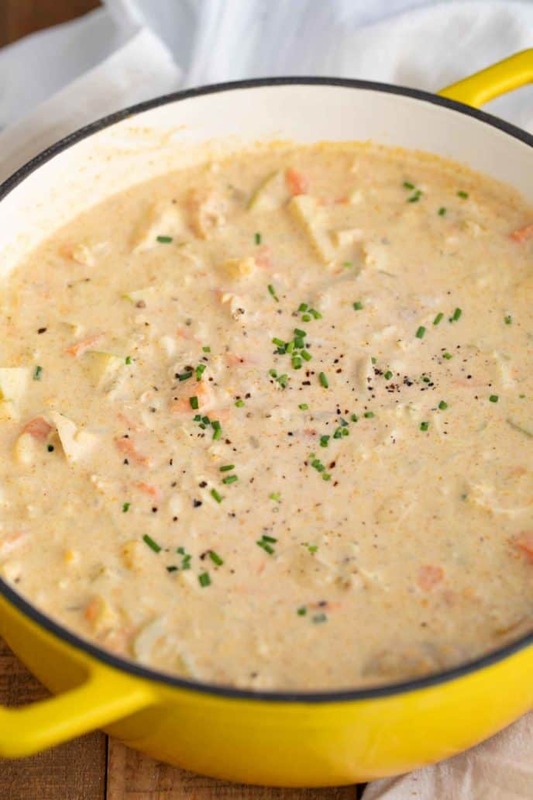 This soup looks truly delicious, inviting and comforting! Cannot wait to try this Indian treasure! YUM!! Never heard of the Mulligatawny Soup before but sounds like a perfect dish! So comforting and creamy. Need to try it! It’s fun trying new dishes! I hope you enjoy it. This will totally hit the spot! Enjoy! 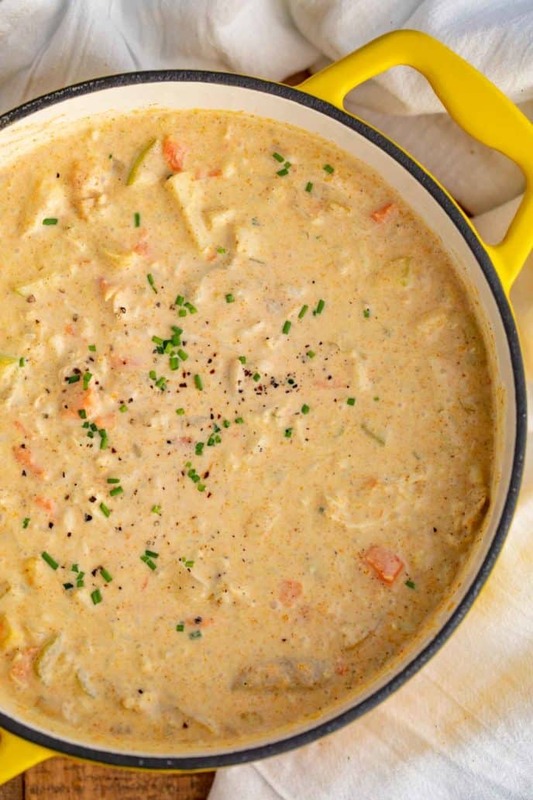 I love mulligatawny soup, and this one looks so rich and creamy. Since I have lots of leftover chicken, I just might have to make this. Perfect way to use it up! I’ve never tried mulligatawny soup before but I want to make this soon, it looks so delicious and a perfect comfort food during this cold winter! I’d love to know what you think after trying it. This looks interesting! Is the chicken raw when added to the soup? If so, do you add it cubed? I don’t see what to do with the chicken after it is added? Remove and cube? Serve whole? Sorry, but the ‘chicken part’ isn’t clear to me. Yes, the chicken is raw when added and was cut into small chunks before adding them. I hope you enjoy it! In recipe above what is 1/4 Tablespoon of flour? Should it be 1/4 cup? And if you use the slow cooker, do you cut the chicken up after cooking or before. Thanks for catching that! If you decide to do the slow cooker version, you can either keep the chicken whole or cut it up for the cooking process. Whatever you prefer. I hope you enjoy it!